In Boston, there are many options for enjoying the city without spending too much money. Here are a few snapshots! Today, the section of Memorial Drive between Western Ave and JFK Street is closed for people to bike, walk and play games along the Charles River. Harvard square is a short walk away and you could look at the Harvard Bookstore and the Harvard COOP for a great selection of books. I take note of the books currently being recommended, and then order them via Interlibrary Loan. 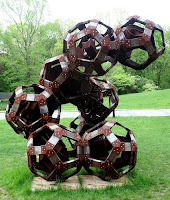 The Sculpture part at DeCordova Museum is free on Mondays, when the museum itself is closed. Over 35 acres with about 75 artworks scattered on the grounds. A great place to take pictures, go for a walk, enjoy artwork or just relax. Where: DeCordova is located in Lincoln, MA, about 30 minutes drive from Boston. Cost: Transportation to and from the museum. Let's make Tuesday a walking day. Boston Public Library in Copley Square is one of the most beautiful Boston landmarks. Inside, you can enjoy the fountain in the courtyard area, walk on the marble staircase and check out murals painted by Singer Sargent, the most successful American painter of the early twentieth century. There are plenty of events held at the library, so you could plan your trip around something special, or just be spontaneous. Nearby the BPL is a Trader Joe's, where you could get a few snacks and walk over to the Boston Common, via Copley square. 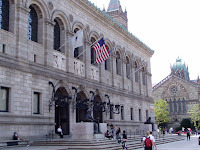 A Day Downtown: Business hours at the BPL are 9-9, Mon-Thurs, and 9-5, Friday-Sunday. Trader Joe's is open from 9am-10pm every day. Cost: The cost of a few snacks! On Wednesday, take advantage of Boston's Museum of Fine Art's free day and check out a new area of town at the same time. The MFA has both contemporary and non-contemporary art, so there's something for everyone to enjoy. 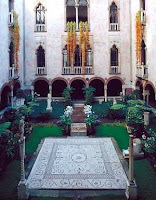 Nearby the MFA is the Isabella Stuart Gardner Museum. The Isabella Stuart Gardner museum used to be a home of the art collector of the same name, and she specified in her will that her art should be kept for posterity. The garden changes with the seasons-- viewing this garden (pictured) is a truly unrivalled experience. If you are a resident in the Boston area, it's very likely you can get a museum pass through your local library. For example, here's the list for residents of Watertown. If you are a Watertown resident, you can get a pass for all the museums I mention in this article (to visit for free any day of the week! ), and many more. 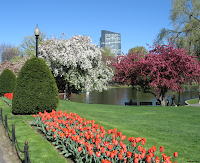 You can visit the Museum of Science, The Boston Children's Museum, the Peabody Essex Museum, the Harvard Museum of Natural History, and the Garden in the Woods, to name just a few. Cost: The MFA is free on Wednesdays or with a museum pass from most local libraries; the Isabella Stuart Gardner Museum costs $5 with a museum pass. The Institute of Contemporary Art is a new Boston museum on the waterfront, featuring the art of many major and upcoming contemporary artists. On Thursday evenings after 5pm, you can visit the museum for free. In the spirit of encouraging young artists, Harborwalk Sounds are a series of ongoing concerts featuring talented young musicians. The stadium seating (pictured right)-- freely accessible all week round-- offers a breathtaking view of the harbour. Transportation note There is not very much free parking, but the ICA is accessible via the silver line. When 5pm-9pm, Thursdays, or any time with a library museum pass. A Mango smoothie at Panera in Watertown will cost you about $4 in the summer, but the experience is well worth it: there's plenty of space to sit inside or outside, and you make use of free wireless or check out the sculptures around Arsenal Park. On occasion, there is also free live music. Arsenal Park reaches back towards the river, so the possibilities remain endless. There's always plenty of space to park your bike or car. You can also visit the Panera Bread's in Coolidge corner, Brookline and in Lexington. Panera offers the opportunity to relax in the city cheaply, and perhaps even avoid a monthly fee for wireless at home! A few steps away from Forest Hills T Station (the last stop on the orange line), the Harvard Arboretum in Jamaica Plain is an oft-overlooked gem for Boston residents. As many of you know, I've been on a mission to spread the news about the Arboretum (see Day 4), and so I couldn't let this post go by without mentioning it. Entry is free, and you can enjoy a picnic, a bike ride with your kids, or just a short walk. The collection of bonsai (pictured) dates back to the 18th century, and if you're lucky you may see a turtle in one of the Arboretum's many ponds. Once you're in Jamaica Plain, check out Centre Street, the bustling center of the neighborhood. Harvest Co-op is located nearby on South Street, where you can choose from a variety of excellent quality produce and grains.